Նախադիտման չափ՝ 800 × 600 պիքսել։ Այլ թույլտվությաններ: 320 × 240 պիքսել | 640 × 480 պիքսել | 1024 × 768 պիքսել | 1280 × 960 պիքսել | 4032 × 3024 պիքսել. 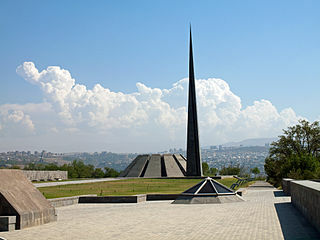 A view of the Genocide Monument above Yerevan at Tsitsernakaberd. Dedicated to the victims of the Great Armenian Genocide in 1915 when 1.5 million Armenians were killed by the Ottoman Turks. The needle (stele) represents the rebirth of the Armenian people. Կաղապար:Օրվա հոդված/Ապրիլի 22, 2016 թ.